A band based out of Ventura, CA providing both traditional and modern day Indie/Gothic/Dark Rock sound with a female lead vocalist. All Contents and Images Rights Reserved by Angie's Curse. GREAT show last night at Green Art People! Thank you LizBeth and everyone of our friends that came out to support us. And to Alex who is one of our biggest fans: Happy birthday to you! BIG NEWS!!! 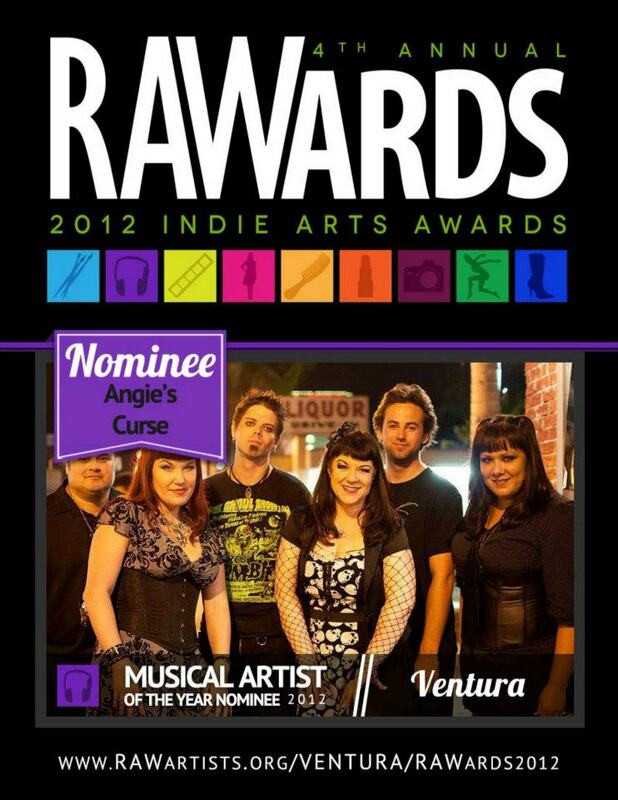 Just found out we were selected to play in the SEMI-FINALS for the RAWards 2012 Indie Arts Award Showcase on Friday, November 16th! Get your tickets now as the night will surely sell out quickly. We will be sharing the stage with Cirque Noir, Josh Slavin, Small Town Zeros and Rubber Neck Lions. Congratulations to our Angie’s Curse friends Dita McEvil (Performance Artist), Manny (Photography), Tazja (Art) and Jonny Blackburn (Art) also made it to the finals. 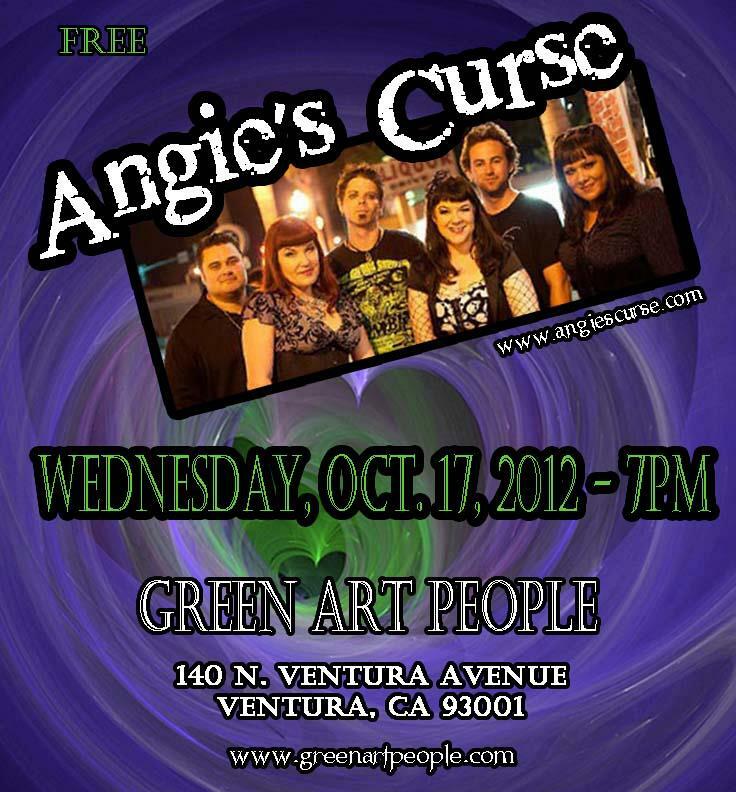 Come out to see us tonight at Green Art People, 140 B N. Ventura Ave.
YOU DID IT! You all made it possible for us to reach our “$5 Bucks from 500 Friends” Kickstarter Campaign goal of $2500. As of this moment we have $2,718 with over 60 Backers and 50 hours left. A big shout out to Neil Gaiman for his re-tweet of our “$5 Bucks from 500 Friends” campaign to his 1.7 MILLION followers. Within 24 hours, we reached our goal. And we can now say we are Neil Gaiman approved! Great show last night with Fangboy and the Ghouls, and Brad Cooper at Golden China. Thanks to all of you ghouls and goths in the crowd. You really made it a fantastic gig! Like “Angie’s Curse” on Facebook!